Enabling the family to do something together, rather than separately, is what millennial parents want, a Scout executive says. 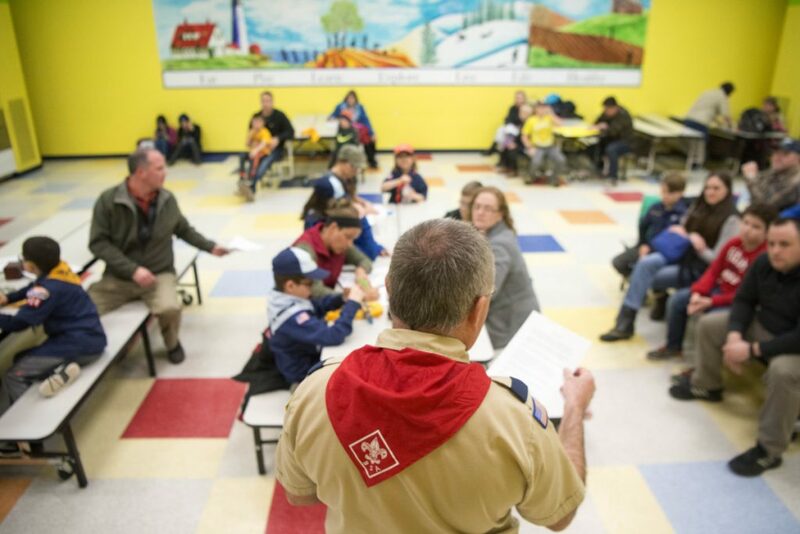 OAKLAND — Over the din of more than three dozen kids and adults, Abigail Wood took a moment out of the activity around her Tuesday evening to explain why she joined the Cub Scouts. Abigail is the middle child in her family and the only girl. Until just recently, she, like other girls in Maine and elsewhere, has been considered a tag-along – doing the activities of her Cub Scout brothers, but without public recognition and reward from the organization. 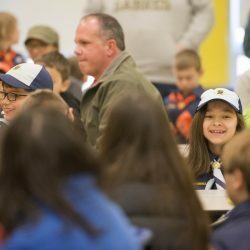 In a move some consider controversial, the Boy Scouts of America announced the organization is welcoming girls from first through fifth grades to the Cub Scouts this year, and girls from the sixth grade and up to join the Boy Scouts, and work to the rank of Eagle Scout if they wish, starting next year. While girls have for some time been able to join Venturing, Sea Scouting and Exploring, this is the first time they have been able to join the Cub Scouts and the Boy Scouts. Eric Tarbox, Scout executive and CEO of the Boy Scouts’ Pine Tree Council, which encompasses the Kennebec Valley, Abenaki, Casco Bay and York districts, said the decision to admit girls was a national one. At least three Maine Cub Scout packs have already begun accepting girls. “It’s driven by a change in demographics,” Tarbox said Friday. The generation that’s now having children is the millennial generation – generally those born between 1980 and 2000 and who make up the largest age demographic in the country – and the Boy Scouts of America, along with countless other organizations, has devoted time and energy into understanding millennials and what they want. At the same time, the organization has been hearing from parents of tag-along sisters like Abigail that they want recognition for their daughters’ efforts. If the girls could already join Venturing, Exploring and Sea Scouting when they are older, the parents reasoned, why couldn’t they join Cub Scouts and Boy Scouts, too? Opening up those two levels of scouting to girls is not as simple as issuing a decree. The Boy Scouts of America grants charters to local religious or community service organizations to operate any of the units under the Boy Scouts. The vast majority of chartering organizations in Maine say it’s a fine idea, he said. Pack 454 in Oakland, where Abigail and her brothers Ethan and Declan are Cub Scouts; Pack 622 in Manchester; and Pack 51 in Windham didn’t wait for the official rollout. They are the early adopters in Maine. Natalie To, 8, far right, smiles with other cub scouts during a Kennebec County Cub Scout pack meeting at Williams Elementary School in Oakland on Tuesday. As long as the packs were able to show they met the criteria that their leaders were trained properly and they had a good plan in place, Tarbox said, they could invite girls to join. And through these early adopters, he said, the organization will be able to learn what’s going well and what needs to be improved on. Tarbox’s wife, Annie, serves as cub master for Pack 51 in Windham. The pack currently has 10 girls and five boys from Windham, Naples, Standish, Gorham and Raymond and was the first Cub Scout pack in Maine to register girls. Willie LeHay, cub master at Pack 454, contacted the Oakland Lions Club, his charter organization, earlier this year about allowing girls to join. Pat Couture, cub master at Pack 622 in Manchester, has heard some of the same concerns. Since 1912, Boy Scouts and Girl Scouts of the USA have followed parallel but decidedly separate paths. Both promote civic awareness, service and leadership and teach a wide rage of skills, and they have evolved with the times. In recent years both have opened their doors to transgender children – the Girl Scouts adopted guidance on serving transgender girls in 2011 and the Boy Scouts announced its policy in 2017. Girl Scouts advocates say the single-gender environment allows girls to try things they may not have tried before, to step outside their comfort zones. Cortney Smart, marketing and communications manager for Girl Scouts of Maine, said since it started, the organization has been focused on the development of girls. The single-gender model allows them to make mistakes and try again and build their confidence, she said. Today, Girl Scouts, starting with Daisy Scouts and Brownies, includes a range of activities from outdoors and life skills to travel and pursuing the Gold Award, Girl Scouting’s highest award, she said. While less recognized, the Gold Award offers the same status that Eagle Scouts attain. “I believe there needs to be a place for girls, just as there needs to be a place for boys,” Donna Rueger said. Rueger has been a Girl Scout leader, at Girl Scout Troop 1254 in Waterville for years. While she understands the convenience that coed Cub Scouts and Boy Scouts offers to families, she grew up in Girl Scouts and her allegiance and loyalties lie with the Girl Scouts. She’s a firm believer that girls stay with scouting not because of what they do in the weekly meetings on Thursday nights; it’s what they do outside that keeps them engaged and interested. Right now, her group is working on raising money to travel to Australia and New Zealand in two years through Girls on the Go, sponsored by the Girl Scouts. Smart said the most important thing for families to focus on is what’s important for their girls and their boys because the development for children is different. Girl Scouts offers what’s important for girls. But even with all that Girl Scouts has, Rueger and others are concerned that enrollment will drop when the Boy Scouts opens its doors to girls. “I am really curious to see what it does to the numbers on either side,” she said. Both Boy Scouts and Girl Scouts lose members over time as the boys and girls develop other interests. In some areas, he said, it’s not cool to be a Scout. Welcoming girls could add numbers, but it will also have to add adult leaders. Tarbox said as girls join Cub Scouts, they will be in girls-only dens, and boys will continue in boys-only dens. 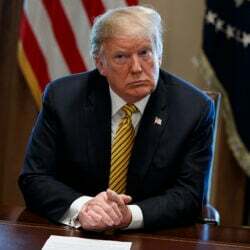 “As we further develop the option for Boy Scout chartering organizations to welcome girls, there will be girl troops and boy troops,” he said. Even with this single-gender organization, Tarbox said boys and girls will interact in group activities like camping and earning badges. It is not clear, however, that such a meeting will take place. In Oakland, as LeHay was finishing up sharing the last-minute details of the planned weekend trip to the science museum in Boston, and as the Scouts worked on their projects, the boys in Cub Scouts said having girls is a good idea. Plus, he said, it’s not fair that girls don’t get the recognition for taking part. Steve Isaac, Bradley’s father, said he has no problem with the Cub Scouts’ new coed status. “If anything, (boys) will learn to interact with girls better, and when they grow up, maybe treat them better,” he said. For Jeremy Conroy, 9, having girls join Cub Scouts means that his friend, Natalie To, 8, can do the same things. On Tuesday, they were working on whittling. Conroy was working on a piece of wood and To was intent on carving soap. Christina Ames, To’s mother, said Natalie screamed with excitement when she learned she could join the Cub Scouts. Ames was a Girl Scout, and her daughter spent two years in the Girl Scouts, as a Daisy and a Brownie, but it didn’t hold her interest. 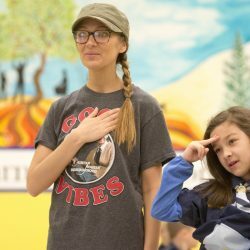 Natalie To, 8, says the Pledge of Allegiance with her mother Christina Ames during a Kennebec County Cub Scout pack meeting at Williams Elementary School in Oakland on Tuesday. “They should have an opportunity to do a different thing than just with girls,” he said. Although Abigail has her foot in the door at this level, she’s keeping her options open. When it comes time to cross over to be a Boy Scout, she’s not sure whether she will. Douglas Wood, her father, was an Eagle Scout, and he thinks his daughter would enjoy it, too. Press Herald Staff Writer Dennis Hoey contributed to this report.